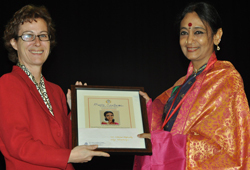 Renowned Bharatanatyam artiste and Guru Prof. Sudharani Raghupathy was honoured with the ‘Natya Kala Acharya’ award by The Music Academy, a premier arts institution in Chennai at their 7th Dance Festival, on January 3rd, 2013. It is a significant and momentous occasion for Prof. Sudharani as this year also marks the centenary of her Gurus Shri U.S. Krishna Rao and Shri K.P Kittappa Pillai. This is how my revered Guru Prof. Sudharani Raghupathy has led her glorious artistic life of 65 years – she never expected awards or accolades – yet they come to her – she never expected students to throng her school – yet they flocked to her – huge audiences at her dance productions are a norm – she never expected to be a globe trotter – yet she is invited the world around – she never expected to attain fame – yet here it is! Prof. Sudharani Raghupathy, started dancing from the age of three, in 1947. Born in Pollachi, she grew up in Bangalore and trained in Bharatanatyam under Gurus U.S. Krishna Rao, K.P. Kittappa Pillai and Mylapore Gowri Amma. She studied Carnatic music under T. Chowdiah, KP Kittappa Pillai and Vidwan Madurai N Krishnan. A graduate in Philosophy and Sociology from the University of Mysore, she was the first Indian student to be sponsored as an international student, at the Randolph Macon Women’s College, Virginia, U.S.A, in 1964-65. Prof.Sudharani established Shree Bharatalaya, an institution for fine arts in Chennai, in 1970. Apart from teaching, she had a highly busy career as a top performing artiste, and was also actively involved in various research projects, presenting academic papers, creating her nationally acclaimed TV production, ‘Bharatanjali’ and touring as well. In 1984, when I joined Shree Bharatalaya, it was with great awe that I observed her teaching advanced students and always dreamt of the day when I would be one of them. Following the nearly six years of training in the basics of Bharatanatyam, I had close interactions and intense learning sessions with Prof Sudharani, while preparing for my ‘Ranga Pravesam’ or first stage performance. This is when I saw and started experiencing the greatness of my Guru as a teacher. Every posture, every movement, every hand gesture, position of the feet, a side glance or neck movement, a lift of the eyebrow, or a restrained smile and a facial expression, she would refine the finer aspects and nuances of ‘abhinaya’ and correct the execution of every ‘adavu’ (dance-step) to perfection with such strictness, that there were several days bringing me close to tears at times. In the following years, under Prof Sudharani’s guidance, I slowly started appreciating the beauty of the Tanjore – Pandanallur style of Bharatanatyam as handed down to her by her Gurus Shri Kittappa Pillai and Shri U.S. Krishna Rao. Graceful bends, firm movements, strong footwork, restrained abhinaya, powerful yet not explicit, and the rich repertoire of dance compositions marked this unique style. While performing ‘abhinaya’ she would ask us to transcend from who we are and become one with the character we were attempting to portray. In performing adavus, she would tell us to rise above the technical perfection of a movement (once it is achieved with rigorous practice) and simply relish the joy of dancing. Through her extensive work, over several years with the India-Study group from Colgate University, New York, U.S.A, Sudha aunty taught us innovative methods of teaching Bharatanatyam to international students. She gave us an experience of collaborative work, through the production of Silappadhikaram – the Tale of Puhar, which had elements of western music, English dialogues, new costume designs, and interesting approaches to choreography and presentation in Bharatanatyam. Master-classes were an integral part of the teaching curriculum at Shree Bharatalaya. Sudha aunty would invite veteran artistes and scholars from various fields, and would also encourage us to attend workshops to help us widen our artistic horizon. We’ve had opportunities to learn and interact with senior and eminent Bharatanatyam artistes like Prof. C.V. Chandrasekhar, Smt. Chitra Visweswaran, Dr. Padma Subrahmanyam, Ms. Lakshmi Viswanathan, Smt. N.S. Jayalakshmi, Dr. Anita Ratnam, and many other respected scholars, dancers and musicians. We have had master-classes in modern-dance, Therukoothu, folk-dances, Kalaripayattu, lighting and costume design and much more. Along with the traditional approach, Prof Sudharani added her own dimension to the art, drawing from her training in the Martha Graham technique of Modern Dance. Breath control, effortless leaps and bounces, floor exercises, and many choreographic techniques were blended into her performing and teaching style. Learning and performing as part of the acclaimed dance-dramas choreographed by Sudha aunty, such as ‘Ramayanam’, ’KrishnamVandeJagatGurum’, ShakthiPrabhavam’, ‘VandeGuhamUmasutham’ and many more, enriched her students with an unimaginable wealth of knowledge. I cherish many memorable experiences of the dance-drama tours with Sudha aunty and the entire team of Shree Bharatalaya. In 1992, the Centre for Cultural Resources and Training, Govt. of India produced a video documentation of Sudha Aunty’s [that is how we fondly call her] acclaimed choreographic work, ‘Ramayanam’, the Hindu Epic Story and text. As one of the core-dancers in this production, I had an opportunity not only to dance in the production but also to assist my Guru in the video editing of this documentation on the artistic side. This was my first experience of working with visual arts and its integration with Bharatanatyam. Those were the days of video cassettes and offline editing was a much more cumbersome process that took up days and nights of work. But this was a unique experience, a springboard to my work in the recent years of editing dance DVDs. One could learn a lot, rather the most, just by observing and watching Sudha aunty during her own practice sessions. She would practise not just for a particular performance or an upcoming event, it was just her everyday way of life. A chance to see her practice was rare. With divine grace, over the years as I matured as a dancer and trained to be a teacher at Shree Bharatalaya, I had the unique opportunity of wielding the nattuvangam (cymbals) for Sudha aunty’s early morning practice sessions. I shall treasure forever those special moments of watching every move of my Guru. In 1995, I accompanied Sudha aunty on a 15-day dance tour to the north-Indian states of Punjab, Uttar Pradesh and Haryana, performing at schools and colleges for SPICMACAY. Along with my friend and fellow student Gayatri Ramaratnam, I had a great experience performing and sharing the stage with Sudha aunty, watching her present lec-dems, and seeing her adorn with ‘aaharya’ (costume and jewellery) and learnt so many valuable lessons to be independent as a dancer. Between 1995 and 2002, Shree Bharatalaya organised Art festivals to mark the milestone achievements of the institution, including celebrating 50 years of Sudha aunty’s dancing career in 1997. During these festivals, we had year-long preparations to present dance productions, honour renowned personalities from the arts fraternity, bring out resource material for dance in the form of audio albums and books (such as, Laghu Bharatam and Madura Margam), and organised three-day events drawing a large audience of members and connoisseurs each day. This endeavour, over a period of seven years, involved meticulous planning, organisation and execution. Here, I had various roles to play as part of the organising team at Shree Bharatalaya, along with other staff members and resource persons. During this time, all disciples of Sudha aunty, were literally immersed in the best of what Sudha aunty had to offer as a Guru, as a leader of an arts institution, as a researcher, as a cultural organiser, and of course as an exponent in the artistic areas of choreography and performance. There was much to learn from the way she planned events, the way she interacted with people, the way she followed a certain discipline, the grace and calm with which she carried herself, despite turbulent times, and ultimately the touch of excellence in everything she did. She inspired each one of us to find that spark of being a holistic artiste. Through her artistic interactions and camaraderie with her contemporaries, scholars, musicians and many others from the arts world, she would introduce us, her senior disciples to develop and establish pathways of connecting, learning and to continue the artistic relationships she has maintained with them over the years. This demonstrates the generosity of a great Guru. In the past few years, Sudha aunty’s contribution to the world of fine arts through the production of Bharatanatyam DVDs, has taken her teaching to dance students and art-lovers around the world right to their desktops, TVs and Ipads. Performing in these DVDs has given some of us, her disciples, an opportunity to reach out to a worldwide audience. ‘Silambam’ is a network of dance schools established by the senior disciples of Sudha aunty at various parts of the world, to continue the tradition passed on to us by our revered Guru. Alongwith the traditional learning, Sudha aunty has equipped each one of us with the knowledge and skill to create and present new work, to collaborate and experiment and to cherish the freedom as independent artistes. Since 2009, Silambam-Sydney has been contributing to the field of art and culture in Australia. Over the years, I was blessed with several opportunities of being with my Guru and assisting her in various capacities as her disciple. There is so much more that she has shared with each one of us, as our mentor and guide which cannot be simply put in words, but can only be felt and experienced. Moving to Australia was a tough decision for me, to be faraway from my beloved Guru, but to begin a new journey. She is always there in my thoughts and continues to guide me from within. Here is to celebrate a life full of meaning, dedication, humility and love of an artform that has steered my Guru Prof. Sudharani Raghupathy to greatness, and serving a purpose she is meant to fulfil in her lifetime – dance!